Avengers: Endgame is confirmed to be the longest movie in the MCU. And while a runtime hasn't officially been announced, it's expected to clock in at three hours or more. So far, we've seen barley two minutes of footage. Which means there is a wealth of story that hasn't even been hinted at yet. Towards the end of last year, we got the first teaser trailer, which hit the Internet like an atom bomb. Then this past weekend, we got our second look with a Super Bowl TV spot that ran just 30 seconds long. Now, an enterprising interloper on the Tubes of You has decided to combine everything for the Ultimate Super Cut. Okay, so you've already seen all of this footage before. But here, it's been trimmed and reedited to give fans a somewhat new look at the movie and what's expected to punch us all in the gut this April, when the final chapter of Marvel Phase 3 finally hits the big screen. Infinity War left off with what is perhaps one of the biggest movie cliffhangers of all time. Thanos achieved his goal of collecting all the Infinity Stones and set forth the Decimation with just the snap of his fingers. With it, half of the world's population vanished, including some of Earth's mightiest superheroes. Gone were the likes of Black Panther, Spider-Man and most of the Guardians of the Galaxy. Left behind to attend grief meetings were the original Avengers line-up, which will also now include Ant-Man and War Machines. Though the first trailer showed our heroes at their lowest point, Captain America isn't going to let them give up. They will fight back and defeat Thanos. How that will happen is another question in and of itself. 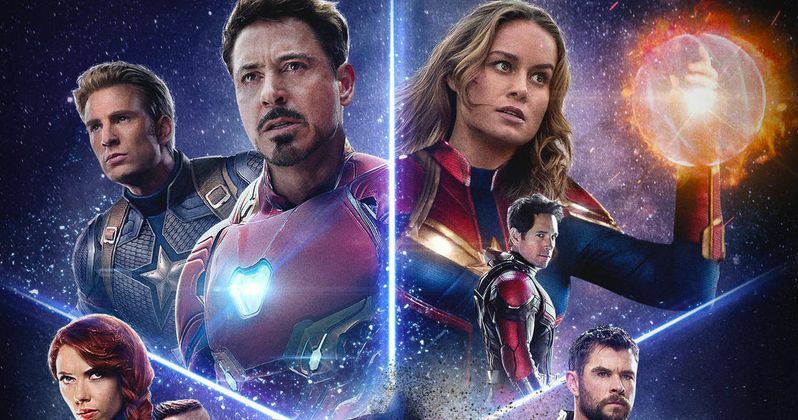 Many believe the Quantum Realm will play a major role in Endgame. There will be some time travel and flashbacks aplenty. We know that Ant-Man has returned from the Quantum Realm in the first trailer. It's also expected that Captain Marvel, or perhaps another secret Marvel hero is along for the battle, as the Super Bowl spot featured new footage with gapping holes in it, as if someone had been erased from existence. Many believe that Carol Danvers was digitally cut from the Super Bowl spot as to not give any spoilers away. Carol Danvers has her own movie coming out in March. Captain Marvel is set firmly in the year 1995, and will introduce audiences to a younger Nick Fury and Agent Coulson. It's also expected to set up Endgame, which will be in theaters just two short months later. Rounding out the trifecta of MCU movies for 2019 will be Spider-Man: Far From Home, which arrives just three months later. It has been confirmed to take place just mere moments after Endgame comes to its rollicking conclusion. And it will officially kick off Marvel Phase 4. You can check out the Ultimate Super Cut for Avengers: Endgame. It was created by Marvel franchise fan Jacob Eriksson. And while we've already been there, done that. We haven't experienced it all quite like this.